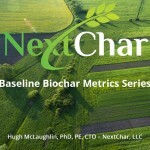 This article is the third in a series of white papers, Understanding Biochar. In summary, the water-soluble organics and ash in biochar influence the initial period when the biochar is initially introduced into the soil. The long term impact is dominated by the water-insoluble and essentially permanent graphitic micro-porous structure, created out of the original plant biomass and transformed by pyrolysis into the biochar. The result is a material that transforms the soil into a cleaner and more productive environment for both the soil biota and the plants being grown.